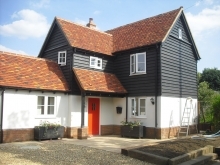 A 1960’s flat roofed caretakers’ house had previously occupied the site within the grounds of Wicken House and a previous consent had dictated the position of the replacement house on the site. The brief required a six bedroom property including rooms within the roof space and a full basement under the main wing of the house. 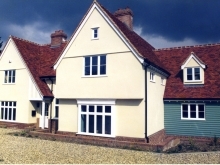 The basement was constructed using reinforced blockwork and an external tanking membrane whilst the remainder of the house was constructed using a timber frame that was manufactured off site. This required careful co-ordination during the construction drawing stage to ensure that the traditional details and proportioning were maintained. The steeply pitched roofs finish at eaves with shaped sprockets and the gables incorporate small jetties and pentice boards. Inside, the rooms are generously proportioned with large halls and landing spaces connecting the principle rooms. 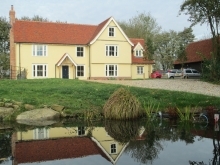 A mechanical ventilation and heat recovery system has been integrated within the timber frame and serves all rooms either extracting moist warm air or delivering fresh air that has been appropriately heated utilising the waste heat from bathroom and kitchen spaces.